The Three Little Pigs shell set can bring a fun game of entertainment for all. Most are familiar with the Three Little Pigs story. You can get creative with a fun patter by many different ways in your routine. They will be taken well with all type crowds, as they will not be taken as a gambling game. Everything can be fully examined at any time without switching anything out. The new Bottom Ridge shell design brings no clues, no rules and nothing to hide. You have full control, where you are not forced to take the pea. ​The game will appear to be played fair. The bottom ridge is not a gimmick, it is just the opposite as it makes it a fair shell. Only you know the undetectable secret to make it an unfair shell after you have them following the pig you want them to follow. The set also comes with four 3/8" soft peas that are know to be one of the best handling peas made. 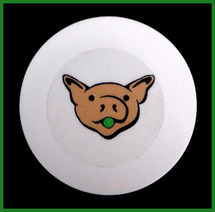 To bring a little more hands on fun for the player a 1-1/2 white ceramic chip that has a pig with a green pea in its mouth is used as a pig pick chip. The cold cast bronze Smokey Fireball Shells are a collector quality type shell set. The shell molds were made from a vintage Smokey cigarette snuffer back from the 60's & 70's. 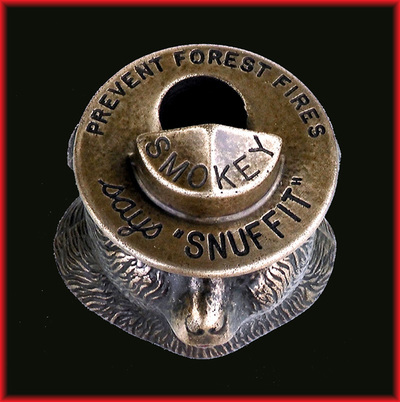 The original Smokey cigarette snuffer is a collectors item today. They had a magnet on the bottom that would attach to the car dash top. Back then all the cars had metal dashboards. 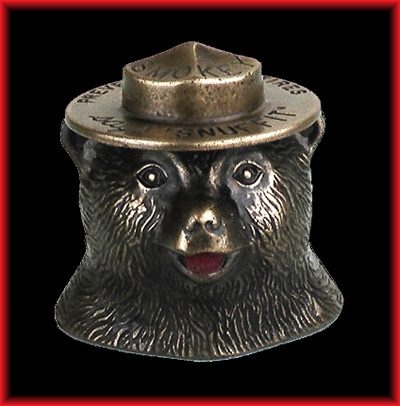 These were a promotional item to prevent fires. To stop people from throwing lit cigarettes out the car widows. The bottom of shell has a bottom ridge added to it. This gives the soft ball another easier path to travel inside the shell to roll freely and will not come out of the shell when the shells are moved. This makes it a fair game shell, to sell the con and everything can be fully examined, if need be. No need to switch anything out. You have full control of the game to be fair or unfair. At any given time you can change the path of the ball by applying a secret move to steal the ball and reload another shell or do whatever you wish to do. This type shell has no dip or any visual hole on the bottom of the shell. They are shells with no clues, rules and nothing to hide with the bottom ridge design. The added bottom ridge is not a gimmick, it is just the opposite, as it makes it a fair shell. When you take the ridge out of use then it becomes a unfair shell, like all other shells, that are used for the shell game. This type shell will even fool the ones that know how the shell game is done. This is because no one will ever know when you steal the ball, as you are never forced to do anything. This is a huge advantage over anyone! The original Smokey cigarette snuffer had a well hole at the center of Smokey's hat to put out lit cigarettes. This well was taken away where it is now just a hole where the ball can be loaded into the shell from the top of the hat or the player can place the ball into the shell of their choice to start the game. The ball cannot come out of the shell from the top once the ball is put into the shell. But after the ball has been stolen from a shell the ball can be reloaded into a shell of your choice when picking up a shell. This can all be done in a natural way, after you have ﻿﻿shown your hands empty and the fingers tips are not near the hole. 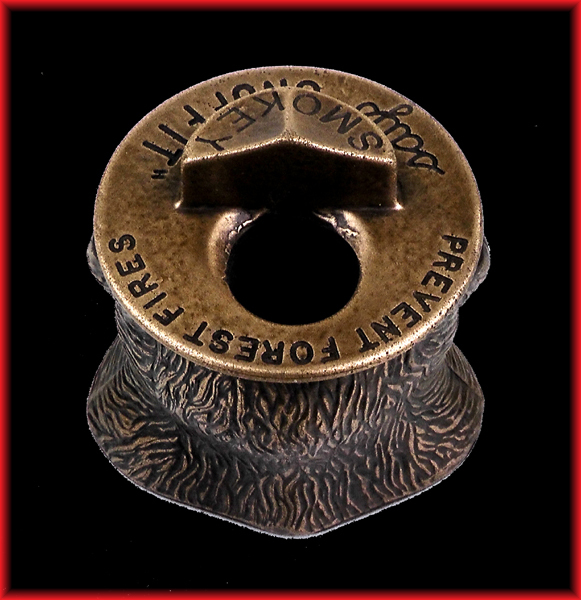 2” L X 1-1/2” W X 1-3/4” H – from top of tail. The Gator shells were design to deliver magical entertaining fun for kids. I find kids can be harder to trick with magic than adults. The design of the shell has many features to bring the right misdirection to amaze them every time. The shells have the Bottom Ridge Design that makes the shells being used to appear to be very fair for them to win. Which the win is normally done at the right time so everyone has fun. Kids love to play games and love to win with a challenge. The ball will stay inside the shell when moved in all directions. This makes it a fair game. The gator shell can eat the apple ball right off the surface and rolls inside the shell. The kids will try to look through the open mouth to keep track of the ball. This is a good misdirection that will work against them, but will give good visual entertainment. 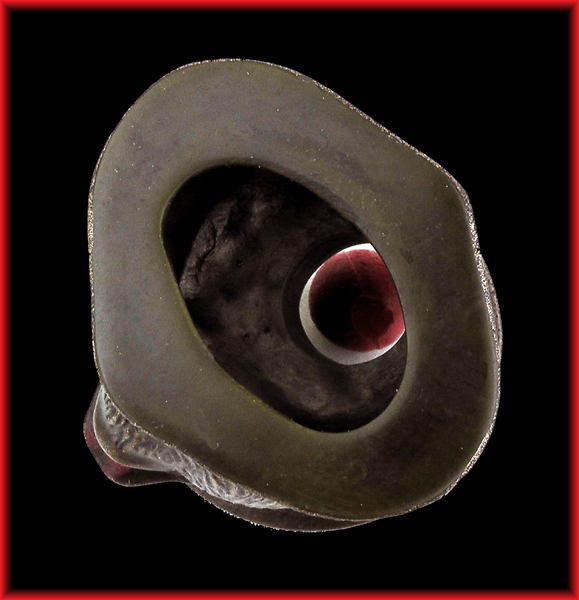 The shape of the shell makes the shells the easiest shells you will find to grip and control. You can push back on the gator tail and the gator will stand up on the two back legs to show what is under the shell, after they make their pick. 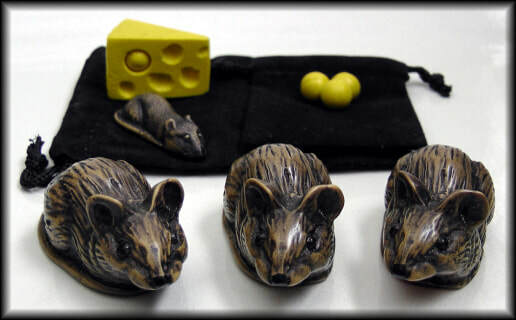 4 - Red Balls 7/16"
The 3 Blind Mice Shell set brings a high level of entertainment to all types of people. They go way beyond the old 3 shell con game. These shells have the 21st century Bottom Ridge design. This new design will deliver more entertainment without all the clues & rules with nothing to hide. * Ball will stay in the shell when moved in any direction. * Ball can be easily taken at any time. You always have full control on what you do. You are ever forced to do anything. * Everything can be full examined at any time, if need be. * Balls are also a 21st century design that work better for finger clipping or handling in the hand. * The cheese slice holds a cheese ball and can be pulled off the cheese slice in starting the routine. The balls and cheese slice are made of the same material and color so they blend together very well. When the cheese slice in put aside after pinching off a piece of cheese for the mice, another cheese ball can be reloaded into the cheese slice. This ball can come into play as reappearing back into the cheese slice when the cheese ball should have been under a mouse. * The realistic baby mouse is another entertaining surprise. * You can get very creative with the 3 blind mice routine patter. * Everything is made in house and tested to meet our high standards of quality control. The barrel case is made of high impact plastic and sized right to hold three monkey shells and accessories. The two part barrel screws together. The monkey on top can hold about a dozen extra peanut balls. The 7/16" bigger peanut ball works as a mouth plug to keep them inside the monkey. The barrel is sized just right to cover the monkey shell with the peanut ball that the spectator holds down and the peanut will escapes from the shell.